There Is Always A Way | Are You Being Real? We all have big hopes and dreams, but how do we persevere through the inevitable and plentiful challenges? 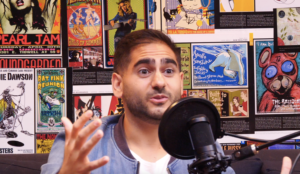 In this week’s episode of the Are You Being Real Podcast, I sit down with Alex Banayan (Author of The Third Door) for an awe-inspiring conversation about how to go after your dreams, no matter what challenges get in your way. Alex is the perfect person to have this conversation with as this week mark’s the completion of his incredible 7 year dream and journey to publishing The Third Door – a book that chronicles Alex’s wild quest to learn how the most successful people launched their careers (he hacked The Price Is Right to fund the project and found a way to track down & interview Bill Gates, Lady Gaga, Warren Buffet, and dozens of other trailblazers!). How did Alex make the seemingly impossible, possible as an 18-year-old college dropout? He took what he calls The Third Door. “Life, business, success… it’s just like a nightclub. There are always three ways in. • There’s the First Door: the main entrance, where 99 percent of people wait in line, hoping to get in. • The Second Door: the VIP entrance, where the billionaires and celebrities slip through. • But what no one tells you is that there is always, always… a Third Door. Which begs the question…Which door do you typically open, and which one will you take moving forward? Alex has inspired me to get more creative and courageous in my own pursuit and I’m excited to introduce him to you! Feel free to tune in to our podcast discussion and get your copy of The Third Door. Wishing you tremendous bravery, joy and success in whatever quest you are on! PS – if you are looking to break out + excel and could use coaching and/or accountability, let me know.